The vaquita (Phocoena sinus), with its signature dark eye ring, is critically endangered. Photo by Thomas A. Jefferson, from the joint investigation project with the Coordinación de Investigación y Conservación de Mamíferos Marinos of the Instituto Nacional de Ecología (INE). Image taken under the permit No. DR7488708 from the Comisión Nacional de Áreas Naturales Protegidas (CONANP), SEMARNAT. Chris Glass wouldn’t blame you if you’ve never heard of the vaquita. The small porpoise is so secretive that it wasn’t discovered as a species until 1958. Plus, there are only about 60 of them in existence, all in the upper Gulf of California, making the vaquita the world’s most rare marine mammal. 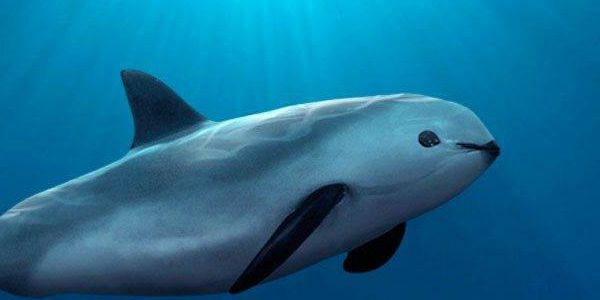 There are fewer than 60 vaquitas in existence. Last month Glass, director of the Northeast Consortium and a research professor in UNH’s Ocean Process Analysis Laboratory, was tapped to lead an international committee of experts committed to saving the vaquita by improving fishing techniques. His appointment, announced by Mexico’s National Institute of Fisheries and the World Wildlife Fund, follows a bilateral agreement by President Obama and Mexican President Enrique Pena Nieto to protect the vaquita. Gillnets, nearly invisible fine nets that entangle and capture target fish, are by far the largest threat to the vaquita, who get trapped and, as mammals, drown. Mexico has made a two-year ban on gillnets permanent, so Glass and his committee aim to improve vaquita-safe fishing technology to support shrimp and other fisheries in the upper Gulf of California.